Sony F5 can record 4k, 2K and HD in up to 59.94p in XAVC. It is equipped with AES/EBU digital inputs for up to 4 channels of audio. Want to import Sony XAVC MXF to FCP easily? 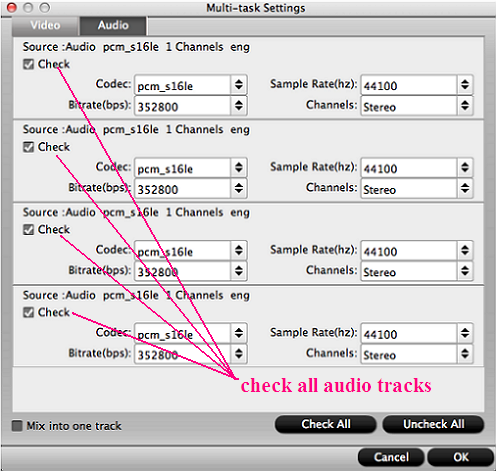 This article provides an easy solution to convert XAVC to ProRes with 2 audio channels. "I'm trying to load in Sony F5 footage and it only sees one channel of audio (channel 1)? Why the Sony F5/Pavtube combo wouldn't be hearing the audio on channel 2?" At present, most conversion tool will automatically combine all tracks into 1 track when converting XAVC MXF to FCP. 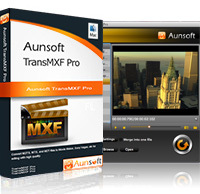 In the case, Aunsoft TransMXF Pro for Mac stands out as the only completely multichannel project solution to preserve, export and preserve multiple audio streams from original MXF. When MXF are with channel 1 and channel 2 recorded by different mics, the Pro can allow user easily transcode XAVC MXF to ProRes MOV with 2 separate channels of audio. Besides, you can also convert 4K XAVC MXF to ProRes. Moreover, no matter MXF footages from Panasonic P2, Sony XAVC, or Canon XDCAM are recorded with 2, 4, 8 or more audio tracks, you can easily preserve all tracks or get separated channels of audio from source file. Why should we choose conversion instead of importing XAVC footage to FCP directly? This is a good question. Personally, I'm trying to import Sony F5 MXF into FCP X. I updated to FCP X 10.0.8 which claims that it is now able to support the Sony XAVC codec but it is still not recognizing the files (they are grayed out). In the Apple forum, many guys have the same problem with me. Especially when you import 4K XAVC MXF to FCP, it crashes. So conversion is necessary. The TransMXF Pro for Mac is outstanding for its multitrack audio technology and easy-to-handle workflow. Below are 4 simple steps to transcode Sony XAVC to ProRes MOV with 2 channels of audio for FCP editing. Click "Start Conversion" icon, TransMXF Pro for Mac will convert XAVC MXF to ProRes MOV with 2 separate audio for post production in FCP. Following the steps above, you can also convert 4K XAVC to ProRes MOV easily. 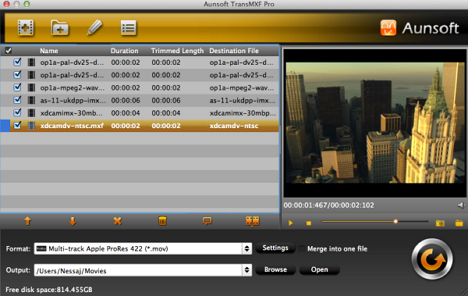 If you don’t care about audio tracks, Aunsoft TransMXF for Mac will be the first choice.